School may be winding down, but we still had time to get in another creative, clay creation. I stopped off at the store to get a few new pens and my daughter HAD to have some clay. Who am I to crush her creativity? So we purchased more clay. We normally go through a couple tubs a year. My daughter loves using her imagination to create. Normally, painting is her primary form of art, but I encourage her to explore and play with different mediums. I was pretty impressed with her two clay creations. She made a couch; complete with pillows. Her other piece..hmm…not sure what to call it. It reminds me of something you’d see in a city park or something. Regardless…it’s cute. My daughter used some newly acquired, glitter glue, to give some color to her arches piece. I like the simplistic look she chose and the contrast of the colored sections to the original clay. Yesterday, for our art class, my daughter tried soap carving for the first time. It’s a relatively cheap, fun and engaging activity. First, I had her take a plastic, serrated knife and sand down the serrations, until it was smooth. Now she had a knife that will work to help her carve. I also gave her a wooden food skewer, in case she wanted to make fine lines in her carving. The goal was not to be able to recognize what she created. 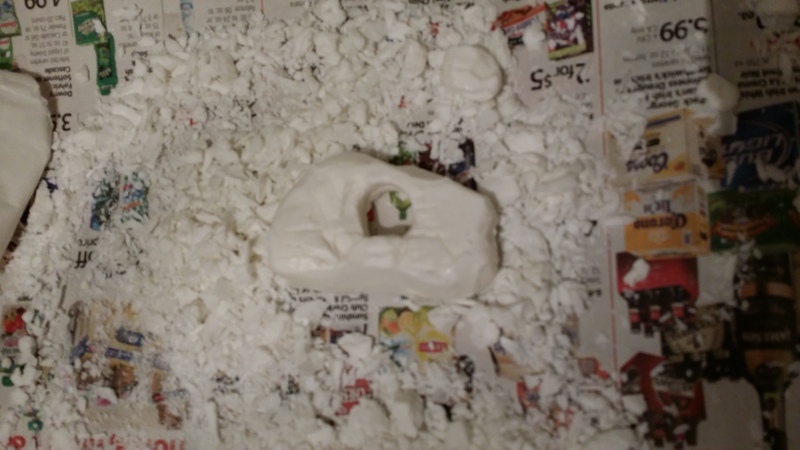 The goal was for her to feel the texture of the soap; see how it reacted to her tools. I want her to experiment with her new medium and get comfortable using it. After she’s gone through a few bars, then templates will be introduced. When we do art, it’s what’s called “process art”. It doesn’t require a recognizable, specified outcome. Instead, it relies on the steps of learning and knowing your medium. It’s creating where the inspiration takes you. It’s using specific items to learn how they work together. Most schools rely on “teacher art”. It’s where there are pre-cut items, assembled in a specific order, to create a specified outcome. It limits creativity and pits children against each other to see who did it “right”. It’s been proven around 9-12 years of age, is when children become overly critical of their own work as they compare it to other students’ work. This is the time when many will decide they “hate art” and that perception will stay with them. I was humbled when I was told yesterday, “When I was growing up, I would have loved the support and encouragement you are giving by allowing her to develop her creativity on her own.” The person who said that is a professional artist. I hold his opinions in high regard and appreciate all the support he offers me. This soap carving is called, “The Circle of Life”. The circle is surrounded by a cloud sitting among other clouds (the shavings). This is what my daughter relayed to me when she finished her carving. This is what she came up with. As any good artist does, she names all her work; no matter what medium she is using.